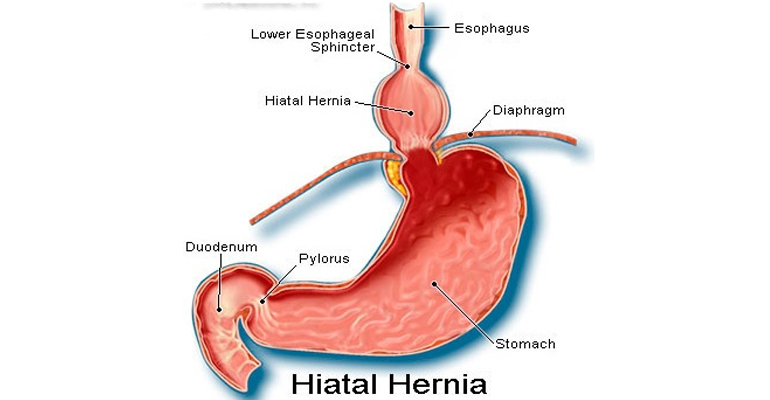 What is Hiatus Hernia ? A hiatus hernia occurs when the upper part of your stomach pushes up through your diaphragm and into your chest region. What are the symptoms of Hiatus Hernia? What is the treatment of Hiatus Hernia? A laparoscopic fundoplication is the procedure of choice. In this procedure with the help of Laparoscopy(key hole surgery) the gastroesophageal junction is dissected , the hiatus hernia is repaired with sutures/mesh depending on the size of the defect in the crura followed by a wrap at the top end of the stomach around the bottom of the oesophagus to form a new valve thus preventing the reflux.